We arrived at the meeting site and we were introduced to our tour guide Anna. We left on time and after boarding a small bus (small group of 17), we were on our way to Girona. Anna gave us great insight into some of the city's history and culture, then we relaxed while enjoying the views on our ride. We arrived in beautiful Girona early and began the first part of our tour in the Medieval part of the city. We had enough time on our own to tour the Cathedral, take photos, get pastries and gelato before leaving. It was quite cold that early too. We then headed to Pals for a brief walking tour and finally, to Calella on Costa Brava. Calella is where we had lunch in a restaurant overlooking the Mediterranean. After delicious food, we had quite a bit of time to wander around, exploring the small, gorgeous town in warm weather. We met up and left, arriving into Barcelona about 6:30pm. I cannot express how fabulous Anna was as our tour guide. She was knowledgeable, interactive, and genuinely loves her job. We highly recommend this tour yo others! Unfortunately, I couldn't find the meet up location. I asked several people on the street who did their best to direct me without me speaking Spanish. I actually walked by the little alley twice not realizing it was actually a street! I was very disappointed that I missed the tour and wasted so much money. Beautiful destinations, charming and lovely. Definitely worth every cent. Our guide, Camilo, was the best I have ever been with. You learn, enjoy, have some wonderful time in beautiful places. What else? Great tour. Girona is absolutely amazing. Relaxing at Costa Brava after lots of walking was wonderful! Beautiful views and great seafood paella! Miguel was a great guide, informative and friendly. Trip was great, in a nice minibus with ac. First to Girona which was great, some history and then time on our own, then to Pals a small European town, then off to the beach area in Costa Brava for some lunch and great beach sites! Ou tour was excellent, almost private, we were only 6 people and our guide and driver Ana, a lovely person. We liked everything: Girona, Pals and Calella de Palafrugell. I highly recommend it. Congratulations to Ana for her excellent work. Excellent guide, lots of interesting memories, lots of uphill and downhill walking, good small group, and many historic remembrance. I thought the tour was very well-organized. Miguel gave us just enough information, answered questions cheerfully, and left us alone when appropriate. I liked starting with busy Girona in the cool morning, then touring quiet Pals— beautiful!— and ending at the gorgeous Costa Brava coast in the hot afternoon— the sea was refreshing! Yes, it’s a long day, but totally worth it to get an overview of 3 different areas. Tour guide Felciano. Very knowledgeable tour guide. he patient and kind and he explained all the things clearly. This tour was great we got to see Costa Brava beaches and Girona city. Girona and Palu is small towns full of history and very picturesque. It's nice to see something outside of Barcelona. 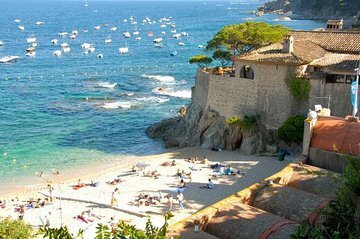 I would recommend this tour to anyone who would like to see things outside of Barcelona, which is hidden treasure which also include one of beautiful beaches of Barcelona. I highly recommend this tour. It’s informative, beautiful and full of memories. The staff is fantastic and really keep you engaged. I would recommend comfortable shoes as some of the stone walkways are old and hard on sandals.